If alliances between competitors are a sign of maturity, then the high-pressure processing (HPP) segment of food processing is a maturing industrial sector. Proof of maturation came April 5 when the Cold Pressure Council (www.coldpressure.org/en) made its public debut during ProFood Tech, an inaugural trade show cosponsored by three trade groups: PMMI, the packaging machinery manufacturers group best known for Pack Expo events; Koelnmesse, the Cologne, Germany, organizer of Anuga and Anuga Foodtec shows; and the International Dairy Foods Assn. Leaders of Hiperbaric USA, the Miami-based division of the largest supplier of HPP presses, have been advocating for a packaging symbol for foods and beverages that have undergone post-packaging pasteurization with high pressure. Simply Fresco LLC, a San Antonio, Texas, processor, already is using the “Cold Pressure Verified” seal on its Cocina Fresca salsa package. One mission of the council is to promote wider use of the seal. Although HPP technology has been used commercially for guacamole since 1996, broader use didn’t begin until makers of ready-to-eat deli meats embraced the technology because it extended refrigerated shelf life to 90 days or more. HPP also allowed processors to minimize or eliminate preservatives to appeal to clean-label shoppers. Growing use of HPP for juice and other products has increased the need for consistent labeling of the process, according to council member Joyce Longfield, an HPP consultant. Whereas supermarket shoppers are unaware if the shelf life of their deli meats has been extended, processors of high-end juices want to raise public awareness of HPP technology “because they had to explain why their juice went from three to 30-days expiration date,” Longfield said at the council’s introductory event during ProFood Tech. Juice and other beverages such as coconut water account for 20 percent of the dollar value of HPP pasteurized foods, which accounted for an estimated $10 billion in sales in 2015. To date, foodservice and business-to-business sales have accounted for much of the HPP volume, but consumer sales are expected to drive the 14-15 percent annual compounded growth forecast for the next decade. To reduce the likelihood of the kind of backlash that has hobbled GMO foods and irradiation, the council wants to popularize the more benign term “cold pressure.” A certification program is being developed for companies that use the council’s logo on their packages. A package logo with a different intent recently was introduce by Chromatic Technologies Inc. (CTI, www.ctiinks.com), Colorado Springs, Colo. CTI has developed a specialty ink that changes color when it is subjected to pressure of 80,000 psi or above, the typical operating range of HPP presses. The ink was developed specifically for foodservice operators as an assurance that packaged foods did in fact pass through the press. Because the process is nonthermal and no visible product change occurs, CTI’s mark provides a visual verification. “At some point, it will have legs,” one HPP toller said of the specialty ink, though he was uncertain of the status of reliability testing. The council estimates 385 HPP presses were in operation worldwide at the end of 2016, including 204 in North America. According to Longfield, 43 companies offered HPP pasteurization on a toll-fee basis. 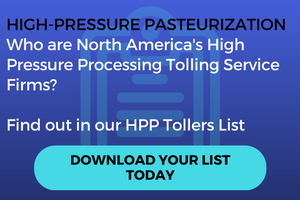 (See our list of 31 North American HPP tolling centers). Hormel Foods is the single biggest owner of HPP lines, though the company only treats its own products, according to Kevin Myers, senior vice president-research & development at the Austin, Minn.-based company. Myers was a research scientist at Hormel in 2001 when it announced it would begin testing the technology on prosciutto and other high-value ham products. In 2011, Hormel acquired a stake in HPP pioneer Avomex Inc., doing business as Fresherized Foods. Avomex revolutionized the guacamole category with Wholly Guacamole, growing it to a $10 million brand in 2000. By the time Hormel and Herdez Del Fuerte SA de CV folded Avomex into their MegaMex partnership, Avomex had sales of $140 million. Until protein processors like Hormel and Tyson began applying the technology, HPP was limited to niche applications such as guacamole and oyster shucking. Aided by Dept. of Defense funding, early research focused on HPP sterilization. But inactivating spore formers requires process temperatures above 158° F/60° C and pressure above 100,000 psi, higher than the limits of existing industrial presses. It also requires hold times in excess of 15 minutes, compared to the 3 minutes typical of the pasteurization process. Nonetheless, research on HPP sterilization continues, notes Myers. One avenue being explored is the addition of ingredients that would help achieve a 12-log reduction of Clostridium botulinum at lower pressures. Hormel’s research also focuses on process changes that achieve pasteurization at lower pressures to reduce maintenance requirements, improve reliability and increase throughput. The R&D team’s highest priority is validating HPP as a pasteurization step for products that cater to growing interest in clean labels, minimal processing and on-the-go snacking. An example is Hormel Gatherings, kits that combine cheese, crackers and meat. HPP “really helps us put party-tray products in a grocer’s refrigerated case,” Myers says. “There’s going to be growing demand for grab-and-go products,” agrees Dave Scheingold, director-supply chain & logistics at Dora’s Naturals, a natural and organic foods distributor in South Hackensack, N.J., that recently added HPP tolling to its service options. Whether the products are labeled “Cold Pressed,” “All Natural, No Preservative” or “Cold Pressure Verified,” Scheingold forecasts significant growth for HPP pasteurization, particularly in the prepared foods category.